Now you do not need to continue driving on with Warning light on. Now you do not need to wait to go to the garage with your car to know what is wrong. Now you can prepare the garage by knowing what is wrong. Keep an eye on your car data. The Mobilscan system comprises an app for your Android device or iPhone (iPad, iPod) and an OBD Bluetooth/WiFi adapter, WiFi for iPhone Bluetooth for Android. Mobilscan gives you access to any information comprised in the so called OBD standard, this means that you can readout fault codes, continuously receive and display a full list of engine parameters like oxygen sensor readings, air mass, temperature sensors and other parameters used by the engine control computer. Mobilscan can hereby help you identify whether the engine is running at its optimum level or you need to replace worn out components. Smart phone with Android 2.1 or newer (download from Google Play free), if the phone is able to download the app from google play, then it is able to run on the phone. 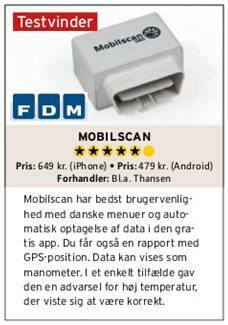 Mobilscan requires that the device is updated to iOS 5.0 or later.